Using rocks (ideally highly polished rocks) to boil water is as simple as heating the rocks to a temperature greater than 100C and transfering the rocks into the vessel with the liquid in which one wishes to boil. If returning stone from liquid to grate to be heated one must be careful as not to drip liquid onto the coals as it may put them out. 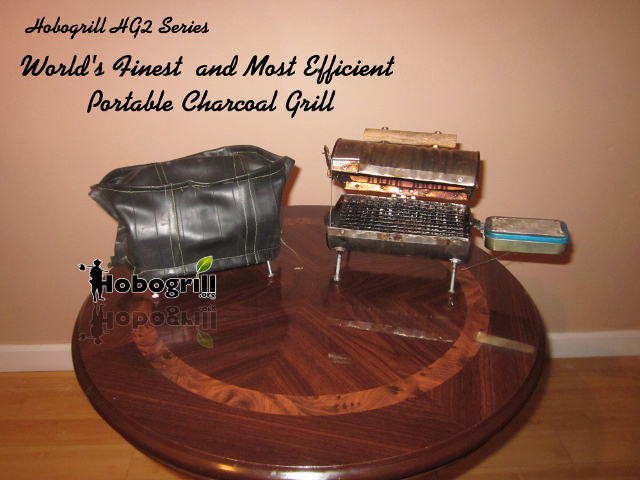 Prepare the hobogrill as usual by lighting the coals and placing food cooking grate surface in place. Place the rocks directly on the grates above the hottest area of the hobogrill. Allow rocks to absorb heat energy from the hot coals. Once you think the rocks are hot enough, transfer the hot rocks to the container with the liquid in which you wish to boil. After the heat has been extracted by the water/soup/liquid and the vessel liquid reaches equilibrium with the rock(s), the rocks maybe transferred from drink/soup vessel back to the hobogrill to be reheated and the cycle can continue until the desired target temperature has been reached of said drink/soup/liquid. If returning the rock/thermal battery to be reheated on the grate then one must be careful as to not douse the coals with liquid as it may put them out. The major advantages of this method is that one may heat liquids in normally combustible containers that would normally burn or melt if they were to come in contact with the fire. Container examples include wooden or plastic bowls, bowls made from animal skin, bamboo, or animal bladders. One can even use this method to boil water in a plastic bag. This is a great way to make hot tea, or heat up some soup. Dense glass beads or a highly polished heavy metal would also work well and may not impart any impurities to contents of the target vessel. This section needs to be updated with the proper calculations based on mass of thermal battery, delta T of thermal battery and g/ml H2O and delta T of H2O. Also refer to BTU/gram of coal.